Rinse the quinoa in a fine-mesh strainer for at least 2 minutes under running water. Rinsing removes quinoas natural coating called saponin, which can make it taste bitter or soapy. Drain. Heat olive oil in a saucepan over medium high heat. Add the quinoa and stir for a minute to allow any moisture to evaporate. Add in the water and salt and bring to a rolling boil. Lower the heat, and then cover and cook for 15 minutes. After the 15 minutes, turn off the head and remove the pot from the burner, allow to stand for 5 minutes covered. Fluff it up, and refrigerate until cool. Whisk 1/4 cup rice vinegar with 2 teaspoons sugar in a medium bowl until the sugar dissolves. Add chicken and carrot, season with salt and pepper to taste. Set aside. Whisk everything together till the sugar dissolves. Fill a large bowl with warm water. Working with 2 sheets of rice paper at a time (keep others covered with a barely damp cloth), immerse papers in the warm water until slightly softened (about 15 seconds). Remove and spread out on a clean kitchen towel lining a cutting board. Pat dry with a towel to remove excess water. Lay 2 pieces of lettuce over the bottom half of the rice paper, leaving about 1/2-inch clear on edges. Place about 1/3 cup chicken and carrot mixture on the lettuce, top with whatever vegetables and amount of quinoa you want. Roll up the paper halfway into a cylinder. Fold both edges in to tuck while continuing to roll the paper to seal it closed. Place the rolls on a plate covered with a damp towel so they stay moist as you prepare the remaining rolls. 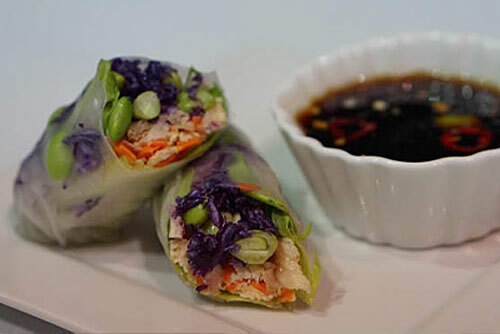 Cut rolls in half and serve with dipping sauce.